KONG Bacon and Cheese Snacks are made with irresistible bacon and cheddar cheese for a biscuit that can’t be beat. Made with all-natural ingredients, containing no wheat, corn or soy, KONG Snacks make the perfect, healthy anytime treat. 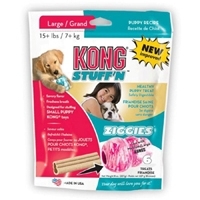 For an added canine challenge, KONG Snacks are also designed to be stuffed into KONG toys. This makes kong stuff'n easy! 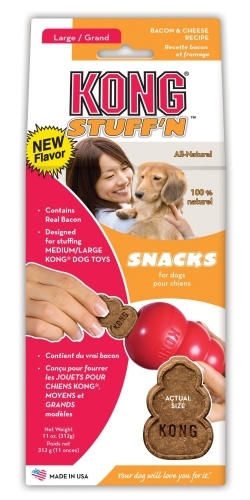 Just squirt the vitamin-enriched treat right into your favorite kong toy, and your pet will stay busy and content. 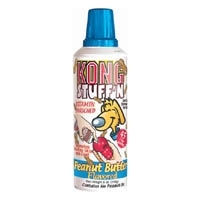 Kong Puppy Kong Stuff'n Easy Treat 8 oz. This puppy treat is specially formulated with real chicken. It is also all-natural and easy on a puppy's tummy. 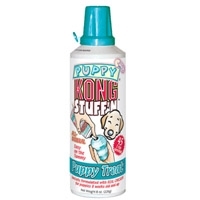 Be sure to use it with your favorite puppy kong toy.